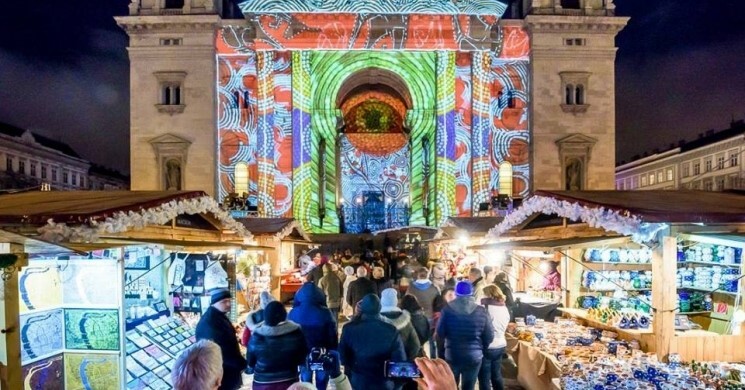 The Budapest Advent and Christmas Fair at Vörösmarty Square opened early this year on November 9, welcoming guests, families and tourists for nearly two months, and offering traditional gastronomy, food and drink specialties. 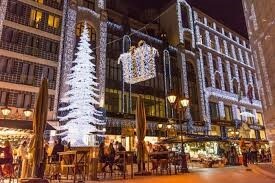 The tradition of the Christmas fair in Budapest can be traced back 20 years ago to when the first Christmas fair was held on Vörösmarty Square. 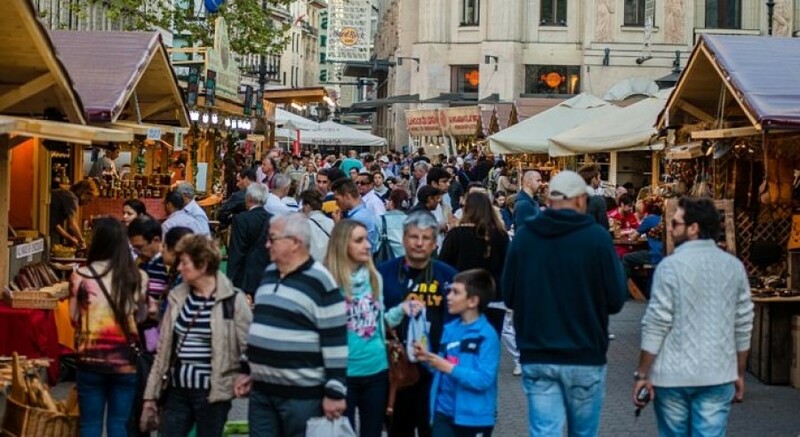 The fair usually attracts 300,000-400,000 tourists per year with its unbeatable location and lovely atmosphere. And given the beautiful light garland decorations and pleasantly refreshing winter breeze, mingled with the appetizing smell of food and mulled wine, a visit is definitely worth your while. Due to the unusually nice weather we have had this past November, visitors were happy to peruse the fair earlier than usual this year. Near to the markets, streets are filled with tourists amazed by the unbelievably picturesque lights, and of course, nobody can resist photographing the exceptional Christmas tree standing in the square. This holiday season people can visit the Advent and Christmas Fair until January 1, 2019. The square hosts many programs, such as live world music, like folk, jazz, and blues concerts, while children can participate in workshops teaching the art of candle-making, beading, basketry, felting, and baking gingerbread. There are trinkets, clothes, candles and many other Christmas gifts available for purchase in the market stands. 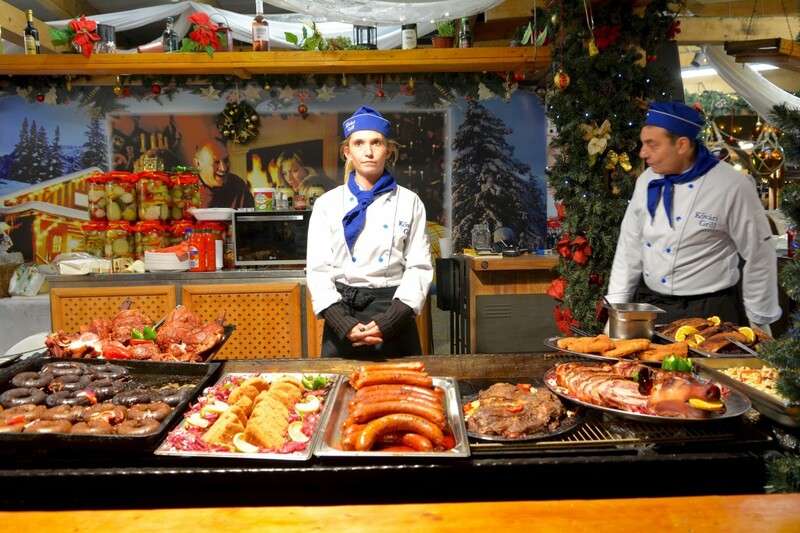 Traditional Hungarian foods are showcased, with much of it freshly cooked on the spot: these delicacies include grilled sausages and meat, roasted pork knuckle, roasted goose thigh, stuffed cabbage served in a bun, fisherman’s soup, roasted chestnuts, honey cookies and many more. Mulled wine and hot tea are also offered as both a sweet drink and source of warmth to enjoy while standing in the cold. Children of course are not left out from having fun: on December 6, children, along with their parents, are welcome to participate in Santa Claus’s visit to the fair. The Hungarian booth rental fee, in comparison with Vienna’s classic Advent markets, which is roughly 23,000 euros (7.5 million forint), is surprisingly analogous. Prices greatly differ in Budapest, where Hungarian hand-craftsmen pay 1 million forints, smaller food stands pay 10 million forints, and bigger food vendors or restaurants may pay up to 30 million forints for their single booth. This price includes a seven-week booth occupation, security, lights, and trash pick-up. 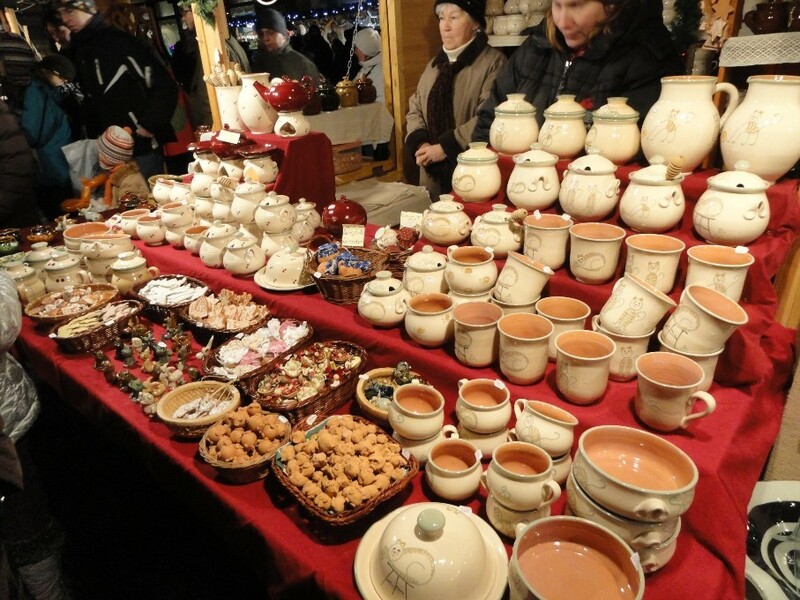 Hungarian traders closely scrutinize for the presence of Chinese products — as only handmade and original products are sold, contrary to Austrian Advent markets. Vendors must count on about 1 million visitors to the fair daily—rain or shine. Finding Vörösmarty square is quite simple; there are many ways to access it by public transport. It is easily reachable by three different metro lines, M1, M2, and M3, with only a short walk from the different metro stations. Tram 2 also stops near Vígadó Square, and Tram 47 and 49 stop near Deák Square, close to the fair’s location at Vörösmarty. There is a similar event to the one at Vörösmarty, in front of the Basilica at Saint István Square. Not only is the Basilica one of the most beautiful and monumental buildings in Budapest, but also, the market itself is included in the TOP 5 Christmas fairs in Europe. This season’s fair is held from November 23 until January 1. All in all, there are 160 booths and 200 different programs for visitors to enjoy in the 40 days it is open. The most spectacular part of the fair is the front side of the building, which is lit up by colorful lights portraying various festive and biblical stories—one of Central Europe’s biggest 3D light projections. These can be viewed every day between 4:30 and 10pm. They consist of projections starting in the beginning of every hour lasting a few minutes. Visitors can also try the ice-skating rink, which is free for all up to 14 years old, including the rental fee for skates. Everyone is welcome to try the ice-skating rink, even with the help of instructors, and to also savor the traditional gastronomic foods.